Frittatas are some of my favorite recipe exports from Spain. They can be made at the drop of a hat with whatever you have on hand. This version is easy to put together for a party, but takes a little planning ahead for the accompaniments. If you are short on time it stands beautifully on its own as well. 1. Preheat oven to 375 degrees. In a large ovenproof skillet sauté onions and potatoes until softened. Spread mixture evenly across bottom of the pan and cover allowing the potatoes on the bottom to form a crust. 2. Beat eggs and cream until slightly aerated. 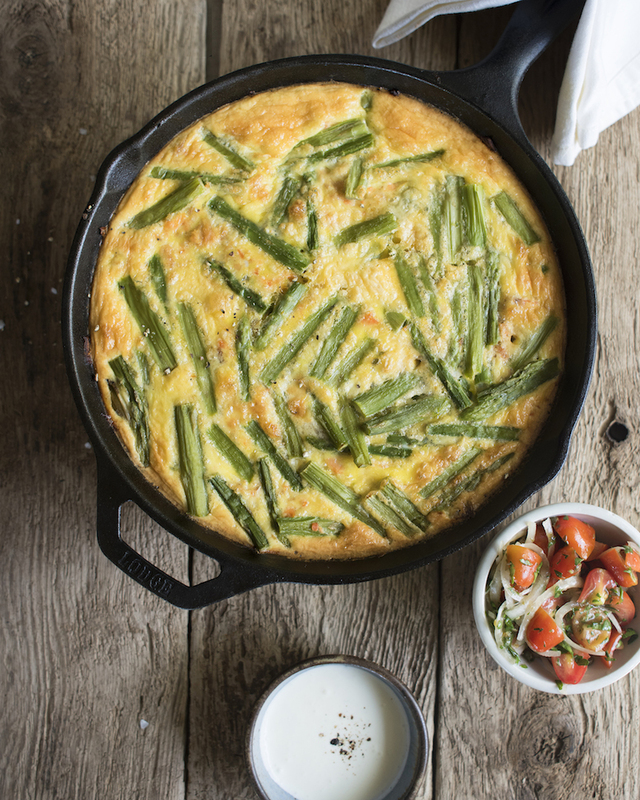 Add Asparagus and Salmon to the skillet in even layers and pour over eggs. Cook on medium heat and transfer entire pan to oven. 3. Bake until cooked through and brown on top (about 20 minutes) and remove from oven, allowing the frittata to cool for 5-10 minutes. Cut into 8 equal slices and serve with ½ cup Tomato Salad and a dollop of Crème Fraiche. 1. In a small bowl slightly “smash” the tomatoes with the back of a fork to release the juices. 2. Add Remaining ingredients and let sit for at least 2 hours, up to 2 days. 1. Combine all ingredients in a Mason jar or other container with tight fitting lid. Let sit over night on the counter (Do Not Refrigerate). It will be thick and perfectly tangy in the morning at which point you can refrigerate any leftover cream. This sounds absolutely delicious! One question: can it be baked, then frozen? You know, that is a good question. I don’t typically freeze egg dishes at home, but I would assume that it would be fine considering you can buy frozen quiche at the grocery store.